Everything changes during pregnancy, and that includes your sleeping habits. As your body continues to change (and your belly grows), you need a little extra support in the upper body and hips. That’s where a pregnancy pillow can be a lifesaver. Pregnancy pillows are designed exclusively to provide support where you need it most. Level of Support: Some pregnant women need more support than others, so decide how soft or firm you want your pillow to be. Most maternity pillows are on the firm side to alleviate discomfort, but you’ll find a few that offer a softer feel. Quality: The quality of the pillow is, arguably, even more important than the support level. The last thing you want is to buy a pillow that flattens or falls apart after just a few months of use. Always opt for a quality pillow that is well-made. Customer Feedback: We talked about the importance of quality, and oftentimes, it’s hard to judge how well a product is made unless you try it yourself. But customer feedback can provide you with just as much insight. If other people say the pillow falls apart or falls flat quickly, you will probably have a similar experience. Ultimately, you want to go with a pillow that is well rated by users. Quality, positive reviews and the right level of support are the key most important factors when comparing pregnancy pillows. Which pillows meet this criteria? We’ve rounded up the best full body pillows on the market to help you find the perfect one for you. Leachco Back ‘N Belly Pillow – The Leachco contoured Back N’ Belly pillow provides support and comfort in all the right places. Because of its unique design, the pillow can be positioned and shaped however you like. Sleep on your side and enjoy full-body support, or sleep on your back with your head comfortably raised and your back fully supported. The choice is yours. The inside of the pillow features hourglass curves to support your belly and back while ensuring that your hips are properly aligned. We love this pillow because you can position it anyway you like, which means you can get the personalized support and comfort you need to get a good night’s sleep. Leachco Snoogle Total Body Pillow – Another great option from Leacho, the Snoogle total body pillow is a best-seller, and once you have a chance to sleep on it, you’ll see why. Developed by a registered nurse and mom, this pillow really does provide you with support in all the right places: back, tummy, hips and neck. The Snoogle full body pillow is similar to the first product we reviewed, but it only extends the full length of your body on one side – not two. That’s not necessarily a bad thing because this design allow for the comfort and support you need without the excess body heat. Complete with a removable, washable cover, this is the ideal pregnancy pillow for moms-to-be who need a pillow that’s easy to care for. PharMeDoc Total Body Pregnancy Pillow – With a breathable, plush cotton cover and luxurious cushioning, the PharMeDoc pregnancy pillow provides full body support. The “J” shaped design allows for extra support in the hips, belly, neck and back. With a fuller, more cushioned filling than the competition, this pillow won’t fall flat after a few months of use. If you’re concerned about chemicals used to manufacture pillows (and other bedding), you’ll be happy to know that this pillow is BPA-free, phthalate-free, lead-free and latex-free. PharMeDoc’s pregnancy pillow will give you the support you need to enjoy a restful night of sleep no matter what stage of pregnancy you’re in. 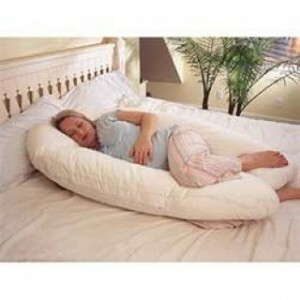 And if you’re a side sleeper, you can keep using this pillow long after the baby is born. Leachco Snoogle Mini – The Snoogle Mini is a compact side sleeper pillow that features Leacho’s unique “J” shape design. It doesn’t extend the full length of your body, but is long enough to give you support where you need it most. With the Snoogle Mini’s design, you can tuck the pillow in between your legs to support your belly and hips, place it under your neck for superior upper body support, or place it under your knees for added comfort at night. Once the baby is born, you can continue using this pillow when nursing. Its flexible design provides adequate back support and a cushioned place to rest your baby while you nurse. Of all the maternity pillows on this list, the Snoogle Mini is the most versatile. Total Body Pregnancy Maternity Pillow – Want extreme comfort and support? The Total Body Pregnancy pillow is oversized, so it provides adequate support for your head, neck, hips and back. Measuring 20”W and 130”L, this is the biggest pillow on our list, and it’s one of the most comfortable. It offers complete body support, and can be shaped however you like. Unlike the other pillows on this list, this one is long and straight (not “U” or “J” shaped). This means that you can conform the pillow to whatever shape you like. With a 400-thread count feel and a zippered cover, this pillow is incredibly soft and surprisingly supportive. Which full body pillow is the right choice for you? Every woman and every pregnancy is different, so proclaiming that one pillow is the absolute best is impossible. The right pillow for you will depend on your needs, personal preferences, budget and the size you need. Needs and Personal Preferences: What type of support do you need? Are you experiencing pain or discomfort in your belly, back, hips, or all three? Determine your needs, and look for pillows that provide you with the support you need in these key areas. Pillows with a “J” or “U” shape are a great option for most pregnant women because they allow you to conform the pillow to the shape that works best for you, and they provide adequate support in key areas, like the back, belly and hips. Budget: With a baby on the way, you want to save as much money as possible. That’s why it’s important to set a budget and stick to it. But remember, good quality sleep is essential to not only your health, but the health of your baby as well. Invest in the best quality pillow in your price range. Size: Do you need a full-body pillow, or a mini contoured pillow? Some pregnant women prefer to have the complete support that full-body pillow offers, while others prefer something less bulky. A mini contoured pillow can give you support where you need it without taking up half the bed. A full-body pillow is best for pregnant women who are experiencing moderate to severe discomfort and pain during sleep. This entry was posted on February 20, 2016 by admin.